Thanks be to Odin, it's Freya's Day! Long ago, a people known as the Varangians lived around the Baltic Sea. Some of them moved south-east into today's Ukraine, and others moved west into Scandinavia. By about 800-1000 AD the two groups had become known as the Rus and the Vikings. 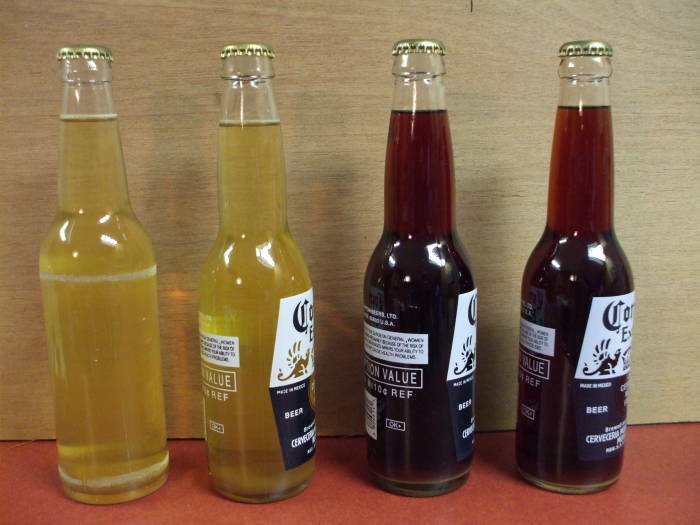 They developed a class of fermented beverages generally known as mead. It was also discovered by the ancient Egyptians, Arabs, Greeks, Indians, and probably anyone else whose stored honey went bad in a good way. Notice that many Slavic languages use a word similar to mead to refer to honey. This reminds me of when I worked in a hospital in Sankt-Peterburg. In the summer you would see the locals walking around in the evenings drinking from two-liter bottles of мёд. Well, sometimes staggering more than walking. In the outer districts of Sankt-Peterburg, in the "sleeping regions" of large concrete apartment blocks, myod dealers operate out of kiosks along the broad streets in the summer. Sankt-Peterburg is about 60° north latitude and so it doesn't get fully dark at night during the summer. Two bottles of home-brewed mead. The local approach is: Hey, it's the "White Nights", let's stay up and get even more drunk! Also see Michael Crichton's "Eaters of the Dead", a great book. I read it and really liked it, but I couldn't figure out how much of it I was really supposed to believe. What about all those detailed footnotes referencing obscure documents in the Leningrad (at the time, earlier and later Sankt-Peterburg) and Baghdad archives? And what about that Ibn Fadlan guy? I wrote a letter to the publisher, and they forwarded it to the author, eventually resulting in a personal letter from Crichton. He explained that he had written it in 1976 almost on a bet with a friend over Crichton's claim that Beowulf could be made into a popular story. Ibn Fadlan existed, and his journey north to the land of the Rus' as described in the first few chapters really happened as described in the book. I agree with Crichton, but I think that the movie Alien made a better argument, popularity-wise, in 1979. Now you're probably ready to see how to brew your own mead.